In answer, River’s baggage opened a bit wider in July to reveal the need for not one but two knee surgeries, the source of the back pain and likely the result of his member-of-the-pack lifestyle down south. 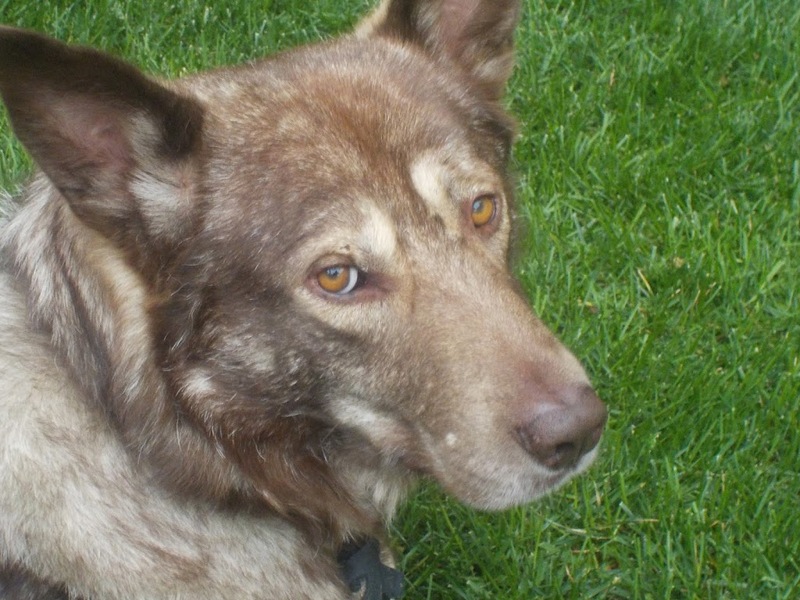 At first, Greg and I were struck dumb with our luck, but dutifully proceeded for what was best for the 18 month husky-mix with the startling amber eyes: He had knee surgery #1 three weeks ago. I cried at the thought of River, not yet with us for a year, in the hospital overnight, in pain and perhaps confused. But except for some initial discomfort, he was fine. 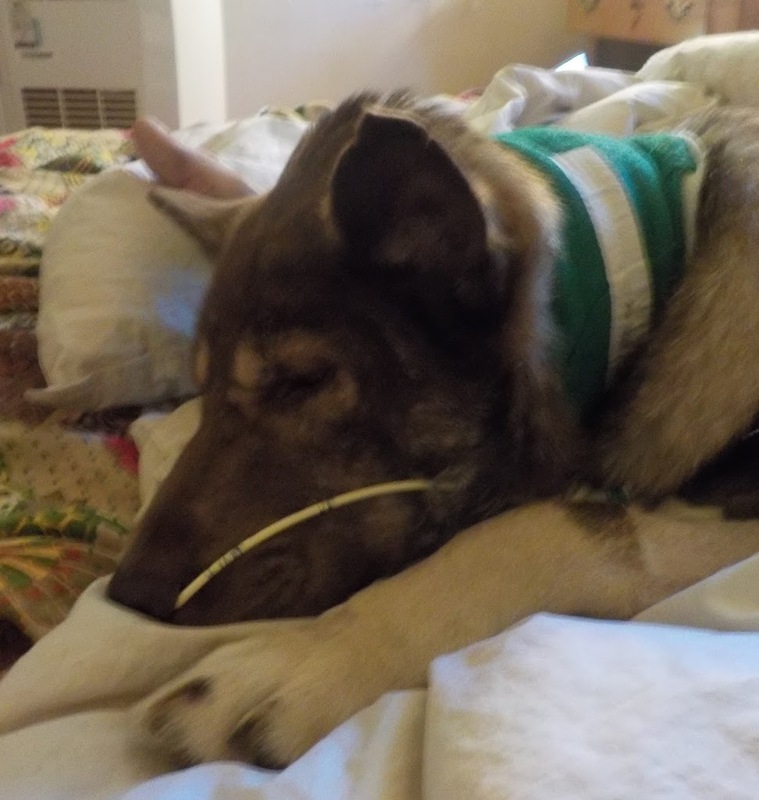 A few days after surgery, River was putting weight on the knee and a week later, pulling on his lead. 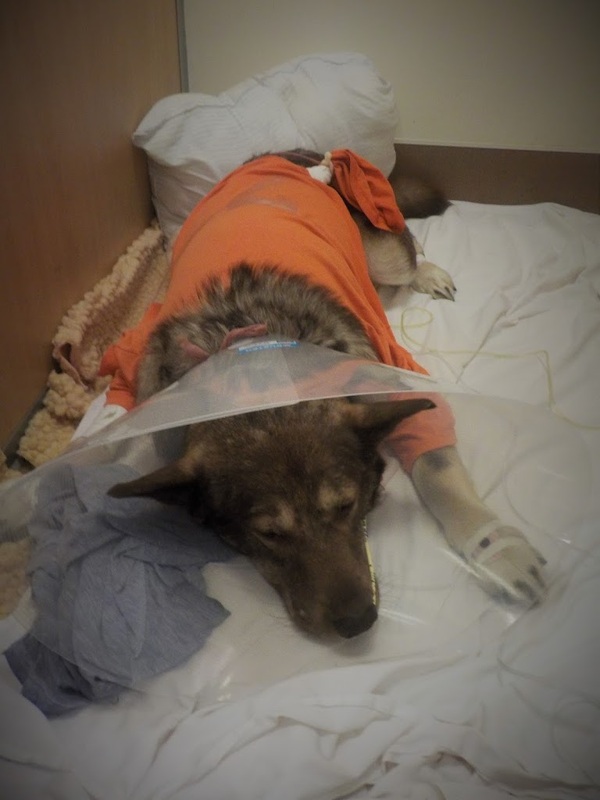 The real test, we realized, would be keeping him quiet for another six weeks, when the plan was to have his other knee done and so bring us all to Christmas morning with a more agile and healthy canine. Greg and I took it all in stride, rearranging funds to support the pup, who we’re certain never lived inside or with humans all the while kicking ourselves for the insurance that could have been. It’s clear our “junk yard dog,” as I call him affectionately, has had a tough past life: Besides buckshot, he’s got facial scars and broken or missing teeth and bow legs, but Greg and I vowed we’d make his future better. On Labor Day, the suitcase spilled more of its ugly contents, revealing additional past neglect, when River was rushed to CSU Vet Hospital for emergency surgery on what turned out to be a previously undetected necrotic hematoma (a battle wound from his junk yard days) that ruptured, spilling blood and bacteria into his abdomen and over-loading his kidneys. Prognosis: Uncertain, but expensive. When River survived the critical 48 hour post-operative window where his chances with sepsis were 50-50, we rejoiced. And each step of the way—insertion of a nasal feeding tube, blood transfusion to support anemia caused by bleeding, we’ve said yes. I could no more tell the vet to stop trying to save our dog’s life because it cost too much than I would have told the doctor to halt the aneurysm procedure that bankrupted my mom. I know that puts me in a particular category of dog owner and the fact infuriates me. Quitting has been either mildly hinted at or outright suggested by a few well-meaning people. This kind of reasoning goes hand in hand with the phrase: “He’s a dog,” a pronouncement that implies what for me are uncomfortable categorizations of living beings. River is not an investment and he’s not expendable. He’s our dog. And he deserves as good a shot at a happy life as we can give him. So when the hospital called on Friday to say River needed dialysis, a procedure that doubled our bill, you know what we said. We’ve now spent more than we did on both our cars combined. River’s prognosis is wait and see. The future is uncertain. But isn’t that what the Buddhists say? All we have is today. And I am hopeful as I write this while feeding my sleeping pup through a tube. Earlier this afternoon, he mildly licked some soft food from my fingers–that’s progress. 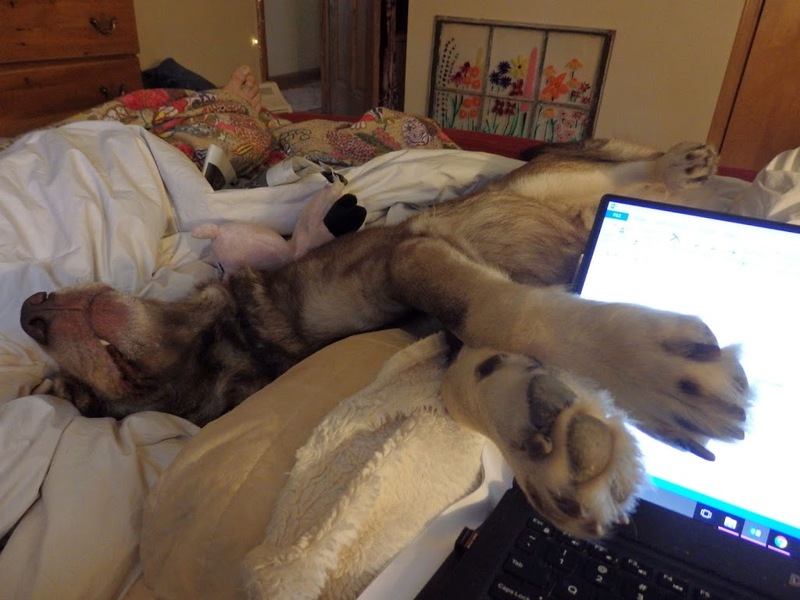 And he’s home, taking up the whole bed again. So long as I can look the dog in the eye and he’s looking eagerly back, we will keep going.